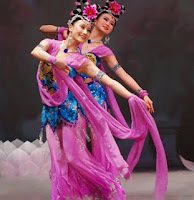 Like most ancient art-forms, classical Chinese dance was condemned during the insanity of the Cultural Revolution. Even today, it is nearly impossible to see such performances in Mainland China, but the New York based Shen Yun Performing Arts company (formerly known as the Divine Performing Arts) has kept the art alive, bringing Chinese classical dance to audiences around the world. This weekend they mark the Chinese Lunar New Year by kicking off a series of performances at New York’s preeminent dance venue, Radio City Music Hall (the storied home of the Rockettes). Shen Yun’s media sponsors include the Epoch Times newspaper, which frequently publishes reviews by your trusted correspondent, J.B. The Shen Yun program also reflects a pronounced antipathy to the Chinese government’s systemic human rights abuses that I also share. However, Shen Yun’s most salient critique of the Communist policies comes through its celebration of the great traditions and ethnic diversity of Chinese classical dance still rejected by Party doctrine. With an entirely new show for their 2009-2010 season (teaser here), Shen Yun can truly be described as a spectacle in the best sense of the word. Marrying beauty and precision their ensemble choreography is quite impressive. Particularly striking are the numbers utilizing long silk sleeves or fan-like handkerchiefs as extensions of the dancers, emphasizing their movements while also creating a kaleidoscopic swirl of color. As with previous shows, Shen Yun shines a spotlight on ethnic regional Chinese dance traditions, like the Mongolian Hospitality dance, featuring ordinary ceramic dishes employed for a percussive effect. For one dance, the ladies of the company also balance distinctive silver headdresses of the Miao throughout a lively number inspired by the Miao and Hmong of Southern China. This year, Shen Yun tells more stories within the show, including an episode from Outlaws of the Marsh by Shi Naian (who was also perhaps Luo Guanzhong, author of Romance of the Three Kingdoms, which was recently adapted on-screen as Red Cliff by action master John Woo). Adding some humor to the mix, the Shen Yun troupe chose to choreograph the crowd-pleasing episode of the drunken Wu Song’s battle with a ferocious tiger stalking a provincial village. The troupe also stages the triumphant return of the Buddhist monk Tripitaka, the protagonist of the era novel Journey to the West generally attributed to Wu Cheng-en. It is scene of the kind of pageantry the company excels at creating. Of course, Shen Yun is always controversial for including a handful of vignettes about the current persecution of Falun Dafa practitioners in China today. Indeed, those who have assiduously buried their heads in the sand since the 1989 Tiananmen Square Massacre will probably not appreciate seeing the human rights abuses they ignore or deny dramatized on-stage. Still, the tone of these Shen Yun interludes is generally positive, anticipating a better tomorrow when China is finally liberated from the oppressive Communist system. Shen Yun always produces an impressive show, bringing to life a history and culture that go back five millennia. It is a rich multicultural stage experience (again in the best sense of the now unfortunately ideologically loaded term). Its New York run continues at Radio City Music Hall tonight and next weekend (2/20 and 2/21) with matinee and evening shows.